Puente la Reina to Estella. Still getting a feeling for this trail, getting at its history. In the USA we tend to build trails out in the wilds, but here, the pilgrim trail has been walked for millennia, so the towns have grown up around it, as have the primary roads. So it shouldn’t be a surprise that a long distance walk is often within sight or hearing of a main highway. Today’s walk, which had many beautiful parts and great villages brought that lesson home. I often felt I was walking on the median strip of a highway. Still, there was great beauty even there. On the way out of town, I walked a bit with “John” the Italian, who I had passed a couple of days before. As often happens, we stumbled back and forth between Italian and English, having a great if limited conversation. A native of Milan, it is John’s third Camino, his second on the Frances. I always like to guess nationalities based on backpacks, usually with good success, but Osprey has been making inroads in Europe, so many Scandinavians now carry them instead of Deuter. John had a beat-up old osprey, clearly the companion of many miles, and his pace, humor, and genuine good spirits made for a wonderful first part of the trail. We crossed fields of dormant grape vines, and he celebrated the wine that would one day come from them, noting it had an Italian heritage as they had been brought by the Romans, something evinced by the very road we traversed which was cobbles and looked (and felt) like a traditional Roman road. The midpoint of the day was in the village of Lorca, where I stopped for coffee con leche and a chorizo baguette. It was mid-morning on a Sunday and they were blasting Puccini opera on the sound system– made me wish I had arrived with John who I expect would have provided the bass line. It was a day of small things, not big sights. Each town had a small church, so old they seemed to almost be growing from the rock that made them. What I found most arresting though was a tiny flower, the only one of its type I saw all day, a grape hyacinth. Such an inconsequential plant, much like the Acony Bell that Gillian Welch sings so poignantly about. I grew up on Summit Avenue in Woodstock Virginia, with four other houses in a row near mine. The rest of the landscape was orchard– peach and apple. Across the street was a mature, mixed apple orchard with trees of great variety (few were the same and the apples were like nothing of the cheap sweetness you can buy today). It was a meticulously maintained orchard planted with lush but coarse orchard grass that was bush-hogged or sickle-barred regularly. 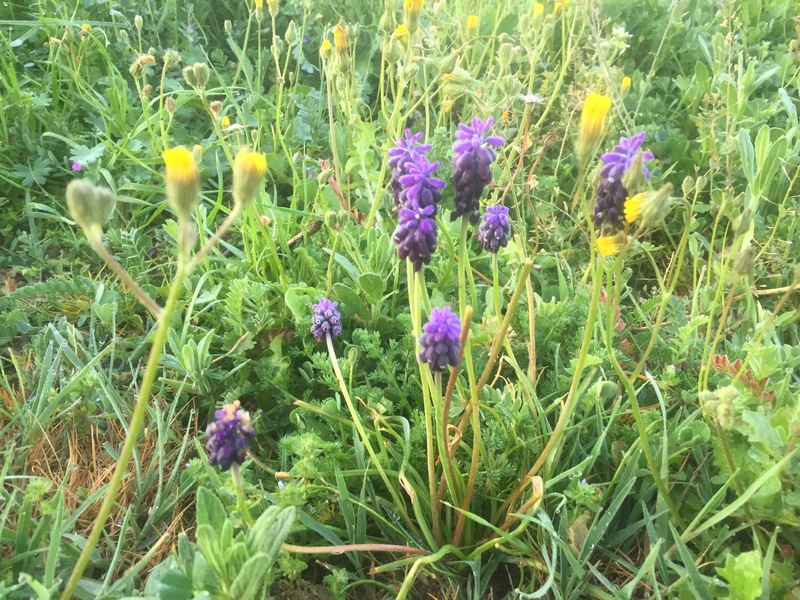 At some point, someone must have sown or planted grape hyacinth throughout, because in the early spring, that green orchard grass floor turned blue with those insignificant flowers. Being a kid, I got to experience them at eye-level, with a detail and intimacy that is denied adults. A blue that for me has defined the color ever since; those flowers are mine.